Though this is a bit off the beaten path of letters and lamenting about all things calligraphic, I have a short story to tell on my dearly departed Mother and my storm-chasing brother. He and I have both parallel and distinctly different lives at the same time. However, as kids, stormy weather tied us together in ways neither of us could ever forget. Photo by Michael Brown, Arlington, Texas. Michael is five years younger than I. We spent a great part of each spring and summer of our youth in a storm cellar. I grew to think of it as merely a spare bedroom a few blocks away, where we spent the night when there was a hint of bad weather. We had a full bed, a cot, and another makeshift sleeping space inside. A coal-oil lamp gave us light. During storms, hail and rain would hammer the metal vents on the top of the cellar and be amplified to sound like a load of gravel being dumped onto a tin roof when we were inside. No connection to the outside world from that hole in the ground. Even local radio KIHN signed off at 10:00. Their ‘cutting-edge’ weather forecasts/reports clickety-clicking off the AP wire located in a closet at the station were read by local hayseed announcers over a wattage that barely reached the Red River on the south border of Choctaw County. The cellar was a thick cube of concrete poured in a large hole dug in Grandma Hill’s chicken yard in Hugo, Oklahoma. It was unceremoniously christened with a glass of Grandma’s homemade blackberry wine in the spring of 1948. I remember it well. It was roomy and dry inside. More than you could say for others in the neighborhood. It could be 10 in the morning or 4 in the afternoon…. or at midnight when Michael and I might be shaken from a deep sleep in our twin beds at home with, “GET UP! NOW!! WE’RE GOIN’ TO THE CELLAR!! The sound of distant thunder at any hour sent our mother into mild hysteria. If it was loud, close thunder, well, it was wild hysteria. She had an abiding and morbid fear of bad weather. Don’t know if it was Dorothy’s experience in the Wizard of Oz or some other mind-altering event that caused such an unusual fear of storms. She never had a close call in one that I know of. Thunder and lightning just sent her into a panic mode. Countless times during bad weather in our different years in elementary and junior high school, the principal would poke his or her head in the classroom where we were and announce, “Kenneth (or Michael) your mother is on the way. Get your books and meet her out front in 5 minutes.” At first it was embarrassing, then it became routine. Even in high school, I’d get a note from the principal’s office excusing me to leave in my little ’52 Chevy for a b-line to the storm cellar. I got kidded about it many times, but I never got blown away in a Hugo storm! And neither did anyone else, cellar or no cellar. But Beuna Brown took no chances, keeping her brood safe in the concrete bunker in the chicken yard at every sign of bad weather. I didn’t inherit or acquire her fear of storms, though I certainly respect them. Now, when the weather looks threatening, I have Gail. SHE survived a 1960 tornado in her little hometown of Soper, Oklahoma. No deaths but the local cellars were full, including her, and the little downtown was virtually swept clean by a bad whirler. In 1982, she was on the cusp of another bad one in Paris, Texas, with our daughter, Erin. Though they say not to drive and try outrunning a tornado, she did that bad day in Paris where 12 people died. The recent storm in Moore and El Reno, Oklahoma, were grim reminders of what bad weather can do in ‘tornado ally.’ Now, we must hunker down in a small closet in suburbia. Now, enter Michael. His experiences growing up with bad Oklahoma weather, then becoming a television news director in Tyler, Texas, in the early 70s, honed his appreciation and fascination with high and low pressures, jet streams, weather fronts, and what havoc the right combination of those wreak on the landscape. In 1975 he became the weekend weather reporter for WFAA in Dallas, Texas. He now has a television production company in Arlington, TX, and lives with his wife, Sandra, best-selling author of books you’ve seen while strolling by any bookstand. One recent one even had a storm in the story. With all that under Michael’s belt, he decided sometime in April or May of this year, to spend good money and gather up with a crowd of a dozen of so other weather freaks and chase some storms. I’ll spare you what little I know about the details of the trip, but what came out of it…that I know about…is worth sharing with you 6 or 8 people who read this column from time to time. The photo above was taken the second or third day of the trip, I believe. He had the presence of mind to upload it to USA TODAY and they published it immediately. It went worldwide from the first bad/pretty cloud Michael and friends ran upon. What a great start for the trip by a guy with a good camera and being at the right place at a perfect time! The supercell had outflow winds of a measly 50-mph and was on the Texas-Oklahoma border. A few days after he shot the photo, he heard from another storm junky/pro-photographer on the OTHER side of the storm, wherever that was. Take a look at this riveting time-lapse recording of the clouds that looks like something from a Stephen Spielberg movie. There you have it. A giant departure from alphabets, etc. Stay safe and if you have a cellar, it’s a good place to be when there is distant thunder! Beuna said so! P.S. This was NOT planned as a part of this, but Gail and I just had an early dinner at SPOONS, the local hotspot on the McKinney Town Square. Sitting behind us was the colorful character below. She got up, went over, and introduced herself to the old boy (born in 1958, the year after Gail graduated from high school) and asked for a photo op. He was prepping for a Christmas in July gig tomorrow at a nearby Harley Davidson dealer, complete with dancing girls in brief Christmas attire. ‘Santa’ will be dressed in shorts, but regalia that will certainly indicate he’s Santa Claus. 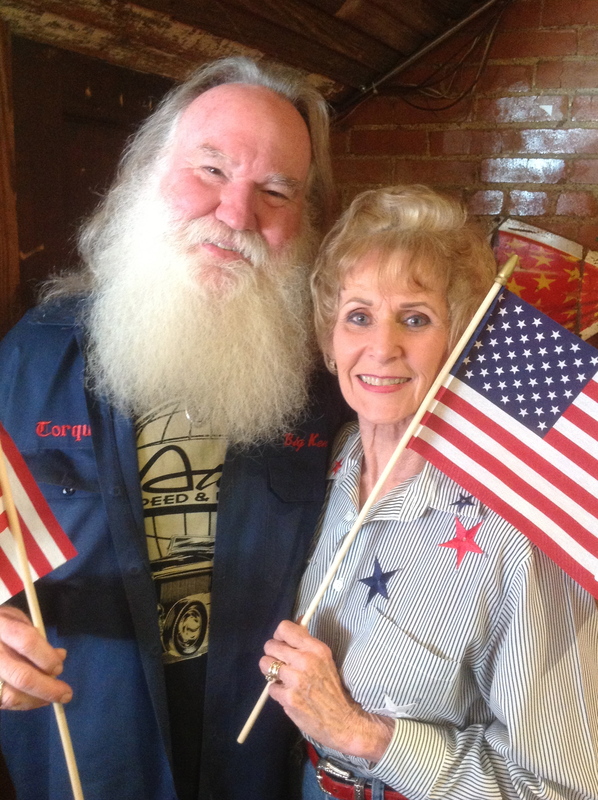 So…Happy Fourth of July from ‘Santa’ and Gail! KEN BROWN CALLIGRAPHY PROVIDES THE MESSAGE FOR A PATRIOTIC VIDEO. I really enjoyed reading about your adventures. Well written, and I have a feeling you have a lot more stories, aside from your engraving ones. Thanks for sharing! Loved the video too. Beautiful. Wonderful story, Ken! I always thought your dad didn’t like storms much, either. I remember when a suspected tornado hit the west side of Hugo many, many years ago and Uncle Robert rode it out sitting in his shop. I remember when the tornado hit Paris, too. I did a story on it for the Lawton paper because some former Lawtonians were in it, as was my former sister-in-law. Fortunately, other than a boat being picked up and dumped into their pool and some major roof damage, they were all OK.
I’m so glad you shared these memories! Ken, Your memories of the storms gone-by were so funny to me because we are about the same age and all of us spent time in the cellar growing up. We live very close to the last “big one” in Moore and the surrounding area and have a heart-felt appreciation for what all those folks have gone through. So thankful to never have actually been personally effected by one—yet! You are a cousin to my brother-in-law, John Brown, who passed away a couple of years ago. We all loved John so much and his passing effected all of our family tremendously. In fact, his sister, Jane Boykin, posted your story and picture and those of your brother on Facebook. You are a very talented writer. All of your pictures and stories would make a wonderful coffee table book since the photos are brilliant, too. I used to hear John speak of you and he was very proud of you. Incredible! Both the still shot and the video are amazing! Cannot imagine watching this storm develop while being so close. Thank you for sharing your story and the visuals. Hello to the beautiful Miss Gail…. Being one of the 6 or 8 who read this column from time to time, I always appreciate your tales of adventure… and this one is no exception. 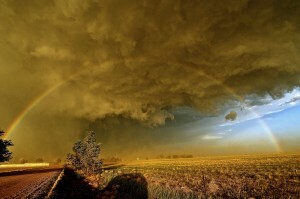 Great pic from Michael and spectacular time lapse as well. Keep the stories coming… I know you have a cellar full to pick from! Happy Fourth to you and Gail. Enjoy!! Hi Ken, I really enjoyed your storm cellar adventures, and Michael’s picture. Both of you guys are so talented, I’m happy to know you. Your dad told the story of you folks going to Galveston just as a hurricane was coming in and what an ordeal. Francis and his mom told of your mom not liking storms, I don’t know many who do. I rode Ike out in Lake Jackson with Francis, and told him I didn’t want to ride another hurricane out, and what does Francis do, he has a heart attack the next year, I guess he didn’t want to ride any more out either. I still miss the big guy, he was a good one. Keep up your beautiful work, I’ll get to another of your engraving sometime. Good picture of Gail, thanks, Margaret T.